To ensure that the human and reproductive rights of every girl are respected and that the fear of physical violence, sexual abuse and the threat of early marriage never again prevent girls and young women from having a full and meaningful life. From 12th-16th Feburary 2018, the Femlead Non-Executive team from UK, France, Netherlands and USA visited Busiiro Community in Uganda. To raise awareness of the reproductive rights and issues for young girls all over Uganda, with specific focus on Buganda region and Busiiro village. 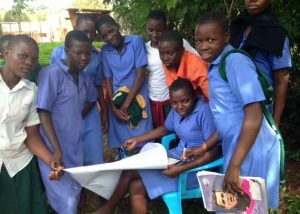 To provide workshops, clubs and set up forums where girls can safely discuss their experiences, especially those that stand in the way of their education. 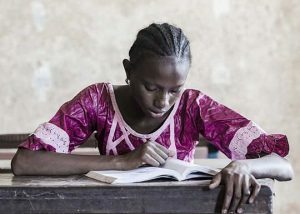 To engage communities, local leaders and the police with the rights of the girl child – especially the right to education, protection and choices. To challenge child prostitution in all its forms. 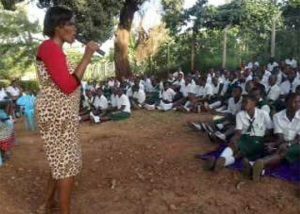 To work with secondary schools to reduce the dropout rate of female pupils. Femlead is a Non-Governmental Organization (NGO) whose mission is to empower young women in Uganda to reach their full potential. Femlead actively challenges cultures and attitudes which prevent the Girl Child from receiving a full education. 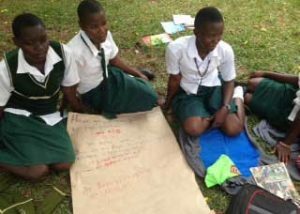 In the Busoga community the challenges are most commonly early marriage, child prostitution in various forms, unwanted early pregnancy, and scarce access to sanitary protection during menstruation. We are working to sensitize the community to the dangers of perceiving the Girl Child as an inferior being. A child who feels like a second-class citizen is more vulnerable to abuse. 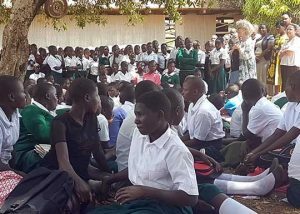 Our aim is to continue the work we’ve already started with the girls at the secondary schools where we are raising awareness of their reproductive rights and their rights to full time education. Our methods are creating a real change to the social attitudes and structures which endanger the Girl Child’s reproductive health and social independence. We are already planning to offer the same opportunity to girls below secondary school age. Since 2015 Femlead has reached out to the girls in Busiiro. Our aim is to empower them with life skills that will help them reach their full potential. 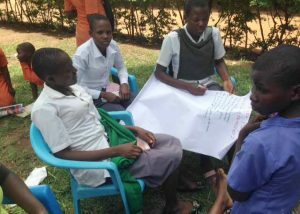 In collaboration with the local school system, we provide workshops and forums in which girls can safely discuss their experiences – especially those that stand in the way of their education, their development and their prospects. Through carefully structured environments like Girl Clubs the girls can openly express themselves, support each other, actively engage with their communities, and share their concerns and challenges. Wherever possible we look into local solutions which can eventually become self-sustaining as well as contribute to the health of the local economy. As well, Femlead engages with the wider community. Meetings have been arranged with parents, local leaders, and the police. The aim, with some success, is to alert everybody to the rights of girl children – especially the rights to education, protection, and choices. In this way the whole community is becoming involved with the education and protection of their young girls. We are researching solutions to some of the most urgent problems. For example, the lack of safe sanitary protection during menstruation. We feel that solving this problem might also help to alleviate the poverty endemic in the area. 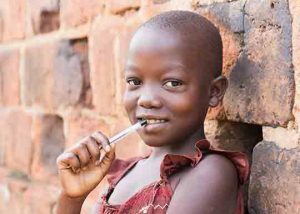 Uganda as a country has for long not considered girls and women as people of value. 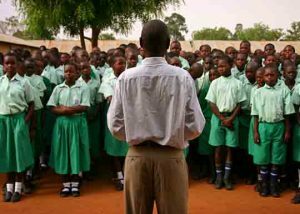 Girls and women in most rural areas in Uganda are considered as the second best to boys and as such their rights and respect is always comprised. It will take time for the girls and women to be fully recognized in Uganda. Femlead is a response to recognizing the startling change in the aspirations of young girls after they left Healing Focus Orphanage Centre (HFOC) Primary School. Having completed the HFOC education and having received excellent exam results, the girls were confident and expressive. They aimed high, hoping to have professions of note, to become for example doctors or lawyers. But after 4 years of secondary education the same girls had either dropped out or graduated crippled by feeling worthless and unintelligent. Somewhere during those years they’d lost confidence in themselves. They no longer had any expectation of further education or independent achievement. The Femlead Non-Executive team from UK, France, Netherlands and USA visited Busiiro Community in Uganda. During their visit, among other activities they met the head, some of the teachers as well as the girls at the Busiiro Secondary school and Healing Focus Orphanage Center – Primary school. 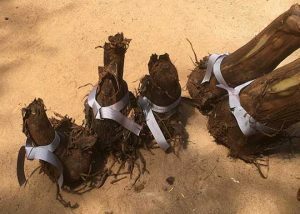 They also travelled to the Busiiro villages and distributed banana suckers to the women groups which had been organized by Esther Bagoole. Seven villages were visited and approximately 700 women received the banana suckers. 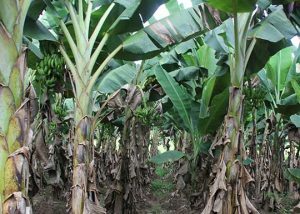 The Banana suckers will be planted alongside their gardens. On 16th February 2018, Femlead launched its Sanitary Pad Project in the same community. The colorful event was attended by over 1000 people including delegates from UK, France, Netherlands and USA; officials from the Local Government in Uganda, Commissioners from Ministry of Education, Local area councilors, Members of Parliament, local people and the Femlead girls and village women Project Leaders. The Sanitary Pad Project was officially launched by a Non-Executive European board member, Jessie Gordon from the Netherlands. 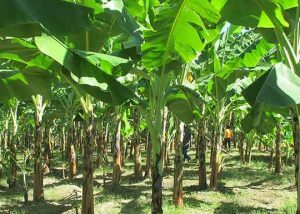 The Sanitary Pad Project aims to manufacture sanitary towels from the banana stems in Busiiro Community in Uganda. 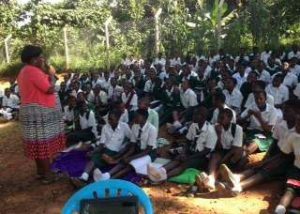 Femlead’s primary motivation being to offer the Femlead school girls free Sanitary Towels to improve their health, hygiene and school attendance. Femlead helps young women discovers their full potential, presenting to them life skills and basic knowledge that builds their character. Femlead core focus is to empower young girls with skills and knowledge that propels them to achieve their goals in life. 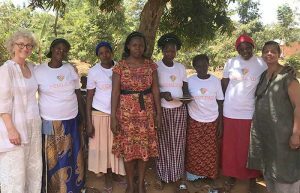 Femlead is a women owned, women run Ugandan NGO. We DO NOT receive government nor big Charity funding. Femlead is funded by like minded individuals, groups and development partners. We operate with complete transparency and accountability. Femlead is a woman owned, woman run, Ugandan registered NGO. Our work is focussed on women and we are committed to achieving gender equality, sustainable development and women’s human rights. We want every woman and girl to be guaranteed the respect and rights that are enshrined in the Universal Declaration of Human Rights. We are an independent organisation funded by individuals, like-minded groups and development partners. We do not apply for or accept government subsidies or sponsorship of any kind. Nor are we associated with any of the big charities. Femlead always strives for complete transparency and accountability. Our donors are welcome to join our annual trips to Uganda to see exactly how their money is being spent. Send us an email and we will add you to our database. Femlead can then send you details of how you can help make a difference, ways to donate, project updates, news and events.